Singapore's central bank has fined the owner of China Aviation Oil (CAO) for selling shares in the crisis-hit firm a month before its collapse. Beijing's China Aviation Oil Holding Company was ordered to pay 8m Singaporean dollars ($4.8m; £2.7m). Singapore-based CAO collapsed last year after running up losses of $550m betting on the future price of oil. The trading scandal was the biggest to hit Singapore since the $1.2bn collapse of Barings Bank in 1995. 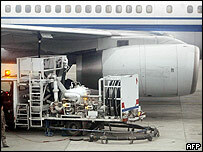 CAO is China's main supplier of jet fuel and is owned by state-run China Aviation Oil Holding Company. China Aviation Oil Holding Company sold a 15% stake in CAO on 20 October, 2004. CAO's suspended chief executive Chen Jiulin said in an affidavit filed in November that the Beijing-based parent company had sold the shares to cover losses at its Singapore division. Mr Chen is currently facing 15 charges in Singapore, including insider trading and fraud. Four other officials, including the president of China Aviation Oil Holding Company, have been charged with fraud and dishonesty in Singapore's courts. The fine was the first levied against a major corporation by Singapore's central bank, the Monetary Authority of Singapore, under rules governing market misconduct introduced last year. "The civil penalty action against China Aviation Oil Holding Company is a signal to the market that we expect all entities undertaking transactions in this jurisdiction to fully comply with Singapore law," said monetary authority deputy managing director Shane Tregillis.